Carpenter Ants Eating Away at Your Home - Yes Pest Pros, Inc. Carpenter Ants Eating Away at Your Home - Yes Pest Pros, Inc. There are a lot of different ant species out there. Most people are familiar with black ants or sugar ants. These ants march around outside and generally stay there (unless they find their way into your home and then find something they like). Carpenter ants, however, are much larger and if they get into your home, the havoc they wreck is much more dangerous. While other ants may just get into your sugar bowl or discover a box of cereal, carpenter ants do serious damage to something much more important – your house. Carpenter ants are called such because of their ability to chew away at wood. Their colonies are typically located in old logs or wooden locations. They chew through the wood, but they don’t actually ingest it the way termites do. They craft tunnels throughout the wood using their large mandibles. While this makes a nice structure for their colony to live in, ultimately it weakens the structure of your home, which can lead to problems later on. It can be hard to know if you have a carpenter ant problem. Because they are literally in the walls and wood of your house, you aren’t likely to see them very often. Carpenter ants do have to venture out from time to time in order to bring back food to their colony. But if they haven’t yet discovered your kitchen, they may still just go outside to get food. Carpenter ants can travel vast distances to get resources for their colony. In which case, you may never see them at all. 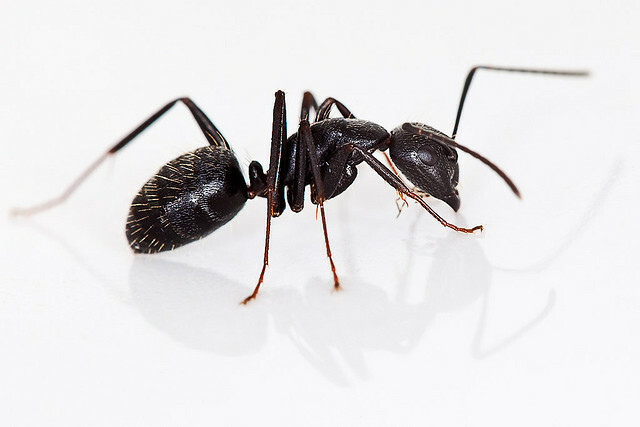 Some signs of carpenter ants are sawdust like deposits on the floor beneath wood, or if the infestation is severe, you may actually hear a rustling sound inside of the wall as the ants move around. Another sign that a carpenter ant infestation is in your home is if you see winged ants emerging from ceilings, walls, or other gaps in walls. This means they are swarming and the colony is sizable enough for them to do so. Carpenter ants need to be removed from your home immediately before they do any irreparable damage. You should forgo trying to remove them yourself as attempts by inexperienced individuals may only serve to spread the colony out further and extend the damage. This means using insecticide spray when you see the ants. They will only avoid that location in the future and move elsewhere. Whether you are in the South Bend, Bloomington, Elkhart or Granger area, Young Environmental Solutions is there and ready to help. With environmentally responsible practices, years of experience dealing with carpenter ants and other pests, and highly trained technicians, we can help you take back your home from carpenter ants and feel at ease once more. After a thorough inspection, we will let you know of our findings and map out a comprehensive plan that will take care of all the carpenter ants as well as prevent them from coming back.